We all know the facts: Belgian soigneur Willy Voet is stopped by customs officers on his way to the 1998 Tour de France start in Dublin. In his car are a massive amount of performance enhancing drugs, destined for the riders on the squad that Willy works for and by which the ensuing scandal will be known. Festina. The lid on organised, team-wide doping is lifted and the Tour comes close to collapse as, over the following days, police raid rooms and haul riders off to cells. Teams are thrown off the Tour and reputations are ruined. But the Tour somehow survives this three week evisceration with Marco Pantani winning but the writing is on the wall for a generation of dopers. Well, it is until the following year when it all starts all over again on an even bigger scale.. But where’s Willy whilst all this very dirty laundry is being very publicly aired? After blundering into the cops on that quiet Belgian road, Monsieur Voet pretty much disappears from the narrative as the media focus shifts to the star riders still trying to propel themselves around La Belle France. A lowly soigneur is… well just a lowly soigneur.. And so he is forgotten from the story. Probably rightfully so. He was just a cog in a bigger machine after all. But as the cog who was nabbed, and who was there from the beginning, as the drug-taking escalated, his story not only tells of the personal hell he endured in the immediate aftermath of the discovery but also adds much unseen background to the shift from the adhoc amphetamine use of Tom Simpson’s era to the industrial use of growth hormone, EPO and a panoply of other, less familiar, ‘preparations’. But who languished in gaol whilst Vinrenque and others protected themselves with prevarication? Voet did. For almost as long as the Tour itself. 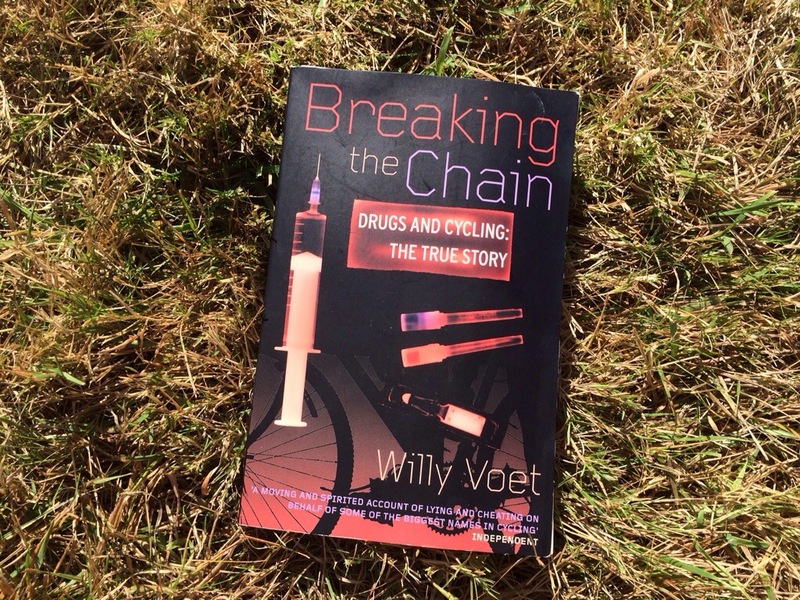 Breaking The Chain – Drugs and Cycling: The True Story (Yellow Jersey Press. £8.99 RRP) is an old book. Originally published in 2001 into the apathetic wake of the scandal and just as the ‘greatest sporting fraud’ of all time was gathering new speed. Nothing had changed. Teams, doctors and riders had not ‘learned’ in the sense of stopping using drugs to win. None had wanted to. They just found new ways to cheat the slowly improving system of detection. Yes, it’s a ‘history’ book but it’s none-the-less valid because of its age. Willy Voet’s story, of the small guy getting caught out and having to carry the can, is age-old and hackneyed but the truth rings as clear as a failed test. Trust and be damned. Willy Voet knew what he was doing as surely as the doped riders knew what they were doing.. His story – the facilitator’s story – is still resonant in a system which would require systemic doping. Without Willy and his ilk (Ferrari, Fuentes, Motorman) doping is no longer possible. Or so we like to think. The book is still as shocking today as it was then. Perhaps even more so, as today the landscape of the sport has moved on and the casual litany of 1990’s drug-taking should be as alien to the current generation as the thought of repairing your own forks at the local smithy. But that is not to say that it’s no longer relevant. Quite the opposite. Willy Voet took a wrong turn. He says as much in the first paragraph of his must-read book. But long before he took that geographical wrong-turn – the one that lead him to the customs officers, to gaol, and to the wilderness – he had already taken the wrong path. He had taken the one to guilt, to denial, to criminality. It’s hard to imagine that he saw it that way though – such was the pervasive nature of the endemic abuse of PED’s at that time. It was just part of the job.. If to want to know the human cost of systemic drug use in professional sport; read this book. If you think those days are done and will never return, if you prefer to bury your head in the sand as so many did when it really mattered – simply ignore this and just look at the weekly results instead.. The asterix’s and strike-thru’s, though fewer in number than in the ‘bad old days’, will catch up eventually. This entry was posted in Product Reviews and tagged Cycling, drugs, dublin, festina, Pro cycling, procycling, Tour de France, willy voet. Bookmark the permalink. ‘SplashMaps’ – The answer to Life, the Universe and Everything?